Maroon football handily beat Carnegie Mellon 28–7 to bring season record to 7–1. 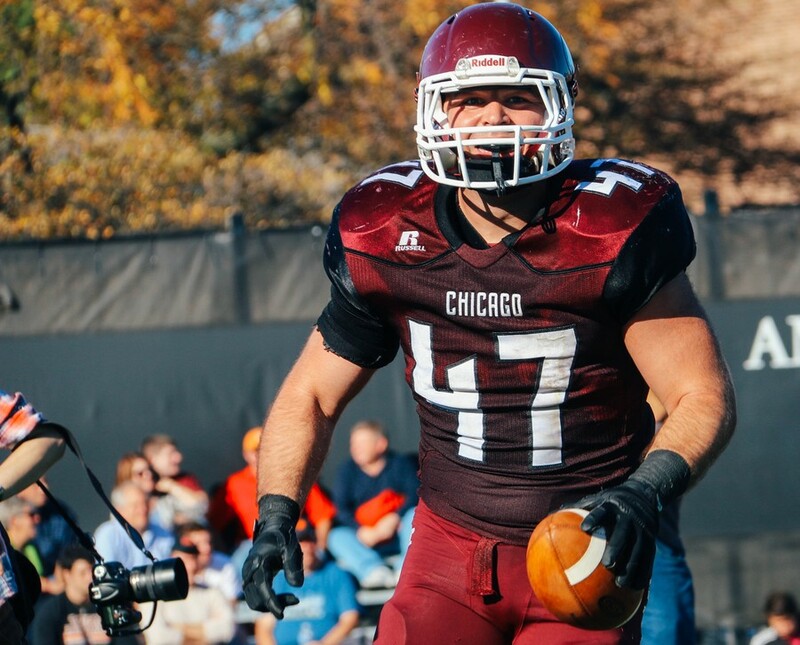 As 12 fourth-year Maroons took to Stagg Field for what would be the last time, a series of bittersweet emotions were running their course. “Taking the Stagg Field for the last time was definitely an emotional time. It all hit me when all of our seniors were standing arm in arm in the front of our huddle doing our usual pre-game chant,” said fourth-year quarterback Patrick Ryan. These emotions translated to the field as the Maroons (7–1) played against their UAA rival, Carnegie Mellon (3–6). Ultimately, Chicago soundly defeated the Tartans 28–7 to clinch at least half of the UAA championship title. The Maroons came out strong, gaining three sacks in the opening sequence followed by a 50-yard rushing touchdown by first-year running back Chandler Carroll. Fellow running back fourth-year Zak Ross-Nash, who has taken the brunt of the rushing responsibility for the past three years, felt Carroll’s standout performance was representative of the passing of the torch for the Maroon running game. Between Carroll and Ross-Nash, the Maroons’ running game proved too much to handle for Carnegie; Carroll ended the game with 110 rushing yards while Ross-Nash added 62 yards on the ground. To compliment the running game, Ryan had an efficient passing game with 142 passing yards and two touchdowns. Ryan found third-year wide receiver Sam Coleman in the second quarter on a 15-yard attempt to bring the score to 14–0. Later on, the third quarter played host to one of the most thrilling plays of the season when Ryan found third-year wide receiver Colin Macri in the back of the end zone with a tremendous pass and catch. Fourth-year captains and defensive linemen Scott Mainquist and Brandon Bolock ended their regular season home careers with banner days. Mainquist earned seven tackles and three sacks while Bolock gained five tackles and two sacks and returned an interception for a touchdown. As the Maroons reflect on the season, many share the sentiments of Ross-Nash that the team pushes itself to greater heights. This win, as well as their win over Wash U, earns the Maroons at least half of the UAA championship title. This is the first time since 2010 Chicago has brought home the conference championship. The squad faces off against Case Western (3–6) in its last game of the regular season on Saturday. A Maroon win would result in sole possession of the title.